The BMW 2 Series comes in two trim levels in coupe and convertible configurations with the significant difference between each being the engine that powers it. The 230i trim level is powered by a turbo 2.0-Liter four-cylinder motor that generates 248-horsepower and 258 pound-feet of torque. The 240i trim level uses a turbo 3.0-Liter six-cylinder engine that produces a whopping 335-horsepower and 369 pound-feet of torque. Both trim levels come with rear-wheel-drive and an eight-speed automatic transmission. 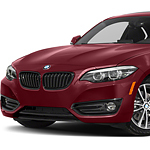 Both the 230i and the 240i trim levels are available for viewing and test driving at BMW Seattle. Our certified technicians specialize in the service, maintenance, and upkeep of the BMW 2 Series.